First off, thank you all for making me feel better yesterday! Some days I just think too much. Today is going to be a non-thinking day! Oh and kickboxing and core fusion help! My legs are officially like jello. I'm weird, but that makes me feel good! Now, back to Thanksgiving in April...well, really, why not? The illustrator has been craving a big pan of turkey dressing, so when we had his friend from high school's family over on Friday night, it was proclaimed as the perfect opportunity to cook a turkey for his leftover cravings. It's kind of funny that he planned the whole meal just for the leftovers. 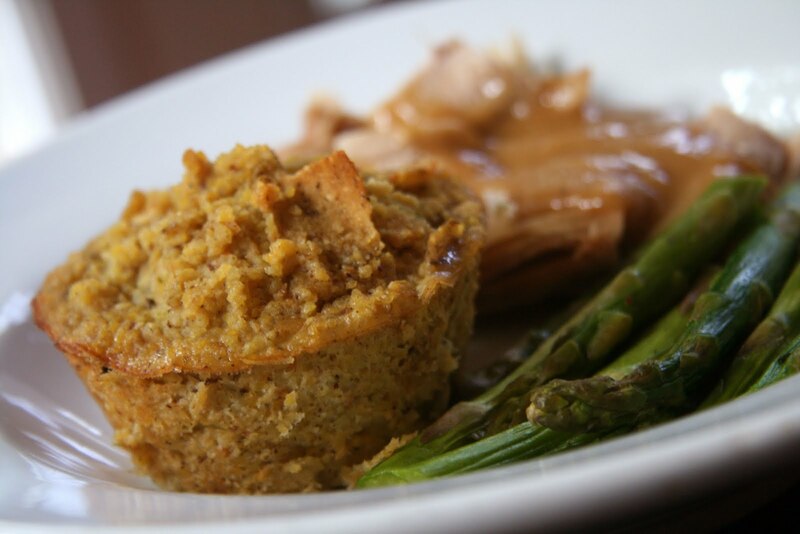 For the actual dinner, we made cornbread dressing muffins, oven roasted turkey with gravy and roasted asparagus. The next day, the muffins were gone...so, turkey dressing was on the menu. I planned ahead and made two pans of cornbread to make this easier. 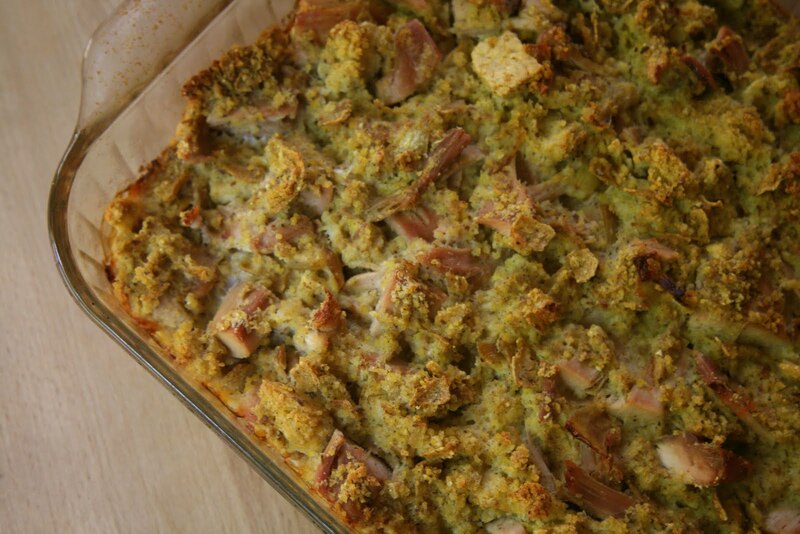 This is the best way to use up leftover turkey! Especially the dark meat since everyone always eats the white meat first. Except Max...he prefers the dark meat. I don't know where he came from. We had leftover gravy that made it that much better! Jay could have bathed in the gravy...he went nuts for it! He is getting so much better with eating things...he even ate asparagus the night before. Go Jay! This was actually the first time I'd made this dish for the boys and they were really happy with it...my guess is it won't be the last! Preheat oven to 400 degrees. Spray an 8 x 8 baking dish with cooking spray or coat with butter. Mix the dry ingredients together in one bowl and the wet ingredients in another bowl. Then add both mixtures together and mix well. Pour the batter into the prepared pan and bake for 25 minutes or until a toothpick inserted in the center comes out clean. Allow to cool. Preheat the oven to 350 degrees. Spray a 13 x 9 inch pan with cooking spray. 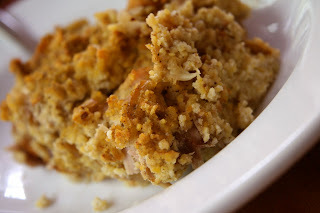 Mix the cornbread thru onion together, but don't over mix because you want there to still be chunks in the mix. Now add the hot broth and stir. Next add the egg and turkey. Stir so that everything is well combined. Now pour the mixture into the prepared pan. 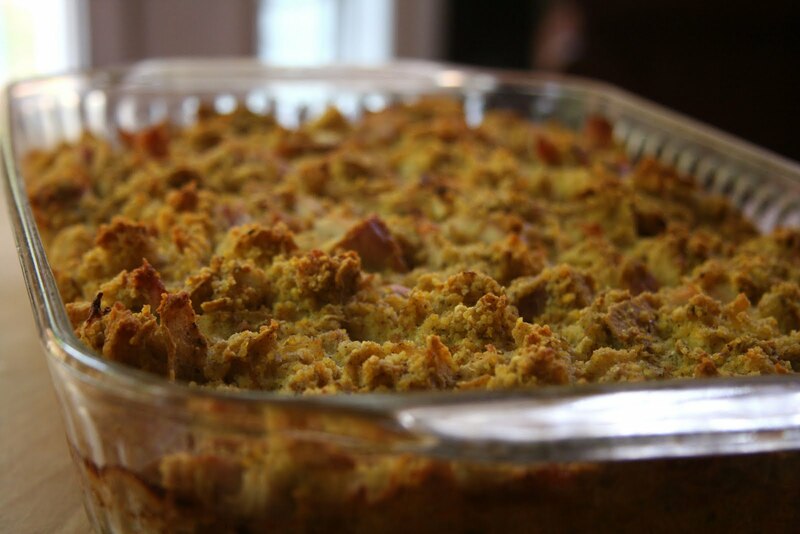 Bake for 1 hour and 15-30 minutes or until the dressing is firm and browned on top. Let sit for 5 minutes. Mix the broth with the flour in a sauce pan and heat on medium heat until thickened. ***I've discovered that mixing the flour with the broth before it's heated really keeps it from clumping up on you. I did kickboxing yesterday too! Hope you are feeling better today. he's so lucky to have you! what a great meal for you man! I love the cornbread. Here's to a non thinking day! Oh yes, a good sweatfest can really help! I hope you're feeling better today. Dressing was something I wouldn't eat until the last 4 or 5 years. Now, when the holidays come around, it's one of the things I look forward to! I love Thanksgiving so why not eat that delicious meal at other times of the year? That dressing looks so good -- and it makes so much! I love having leftovers. Cornbread is a staple in our house - we can't get enough! I love turkey. This looks delicious! So glad that you're feeling better, Sarena. Thinking too much is definitely dangerous sometimes. This meal looks awesome. 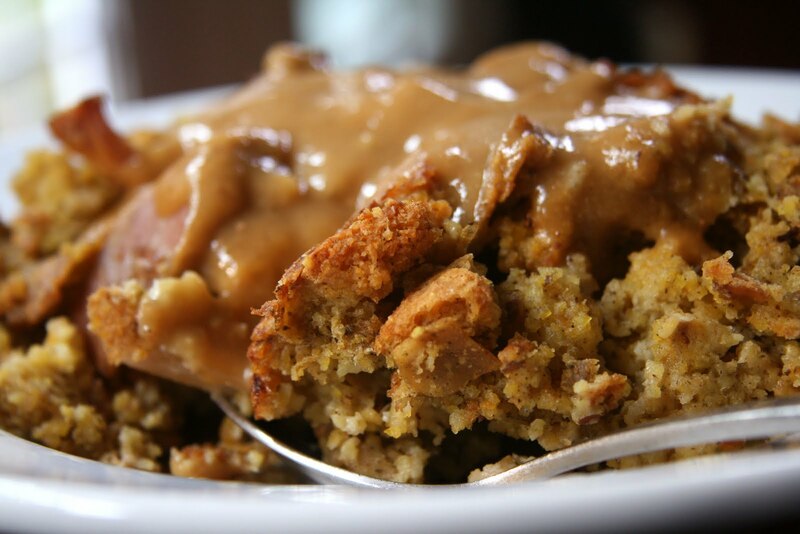 So comforting and delicious. Love Thanksgiving in April - we did something similar as I was doing recipes for my new book and had a few holiday meals - it is now going to become a tradition. Sounds delish! Yum! Thanksgiving SHOULD be celebrated more throughout the year, especially when the meal looks like THAT!